we somehow felt, that such a useful module as QUANTIZER could also be shrinked to 3HP, but same time we wanted an ultimate feature set. Therefore we give you Pico QUANT with quarter tone accuracy and the web-based interface for creating user generated scales. Check it out and let us know, what you think! Got 2 of them...really nice ones! Fellow Verbos user, are you as happy with the Pico Quant as you had hoped? What other quantizers do you have or have you used? This one seems perfect like a perfect match for the Voltage Multistage, pretty much just to make tuning the sliders a bit more accurate and fast. I watched various intellijel videos and the uScale looks pretty cool but it's features seem to be about making it into an instrument itself, which I think isn't why I am into the modular. Maybe I am wrong about that. Hi! Its actually my first Quantizer and they behave as i expected, make Voltage multistage easier to dial in ”useable” melodic content and its really fun to use the Quantizer with random sampling. Overall very Happy with the Pico Quant. Cool, thanks. I think we have the same goals: speed up the VMS programming process. Gonna get me one of these, then. Are they intuitively designed so there isn't a lot of manual reading? Its very easy to use, one button that cycles thru diffrent scales, one knob for glide amount and a tolerance knob. I would suggest to check out the manual for a more in depth look. Seems like this could be a really useful small quantizer. It’s great, very easy to use as Fleuw says. The clock input and output are extremely useful. I replaced my uscale 2 with it to save HP, the only thing I miss every time is the obvious visual feedback on which notes I’ve selected, but I knew that before I switched. I just got a pair of these. I'm a bit thrown by them. The biggest issue is the tuning. I "calibrated" my oscillators by tuning octaves using my Arturia Keystep as a controller. The Arturia should be dead on but when I played through the Pico everything was about 20 to 25 cents flat. Do you have to tune the oscillators while playing through the Pico? Also, I thought it was weird that the tuning seemed to change simply by plugging something into the clock in. I can't figure that one out. It's not thrilling. I know I could probably calibrate my Oscillators to work with the Pico but that seems backward. Perhaps there is a firmware issue? When you use these, do you plug directly into the 1v/octave input of your oscillator? Do you attenuate the output of the Voltage Multistage so that the sliders aren't covering an 8 octave range? Well i keep the sliders below 5 volt mark on Voltage Multistage. Also worth saying is that Im in no way musicaly trained but i can still hear if it would sound too much off for me. So basicly it floats my boat and sound more coherent (musical) to me. Always tune your oscillators while they’re connected to the quantizer or V/oct source you’ll be using. It’s easy and it ensures you’re tuning in the real-world case you’ll be using them in. I did tune them using one of the V/oct controllers I would be using and it's one that is quite perfect - the Arturia Keystep. The source that I am using though is not v/oct, it's sliders. 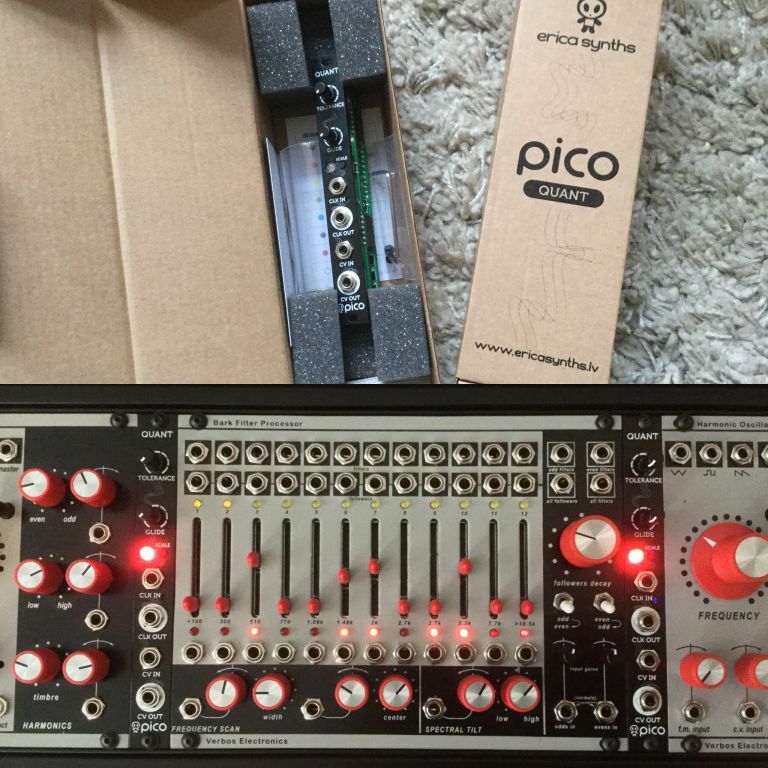 I bought the Pico Quant to help dial in the notes more easily. What I am going to do is calibrate the Pico Quant to the Arturia. The folks at Erica are sending me instructions for calibration. When I get them I will post them here. Once I do that I think I will be set. It definitely makes sense to have one unit as the master. I also have a Doepfer Dark Link. I wonder if that is accurate to the Arturia. I'll take your word. I like your music. I have decided to run the VMS output through attenuating cables to limit that output to around 4 octaves - maybe five - so that I can use the full run of the sliders. 1. Push and hold the SCALE button on the module while powering it up and hold it a second or two when it is powered on. The LED should start to shine red. 2. Turn both of the pots of the Quant module to the minimum level. 3. Then give the signal from the Pico Quant CV OUT to your well-calibrated VCO's 1V/OCT input. 4. Then give the signal from your VCO's out to the tuner and turn the VCO TUNE pot to the level where the tuner shows C0 and get the closest possible position to the C0 and push the SCALE button once). 5. After pushing the button tuner should show C1 or something near it. To get precise C1, turn the TOLERANCE pot till the position where the tuner shows precise C1 and push the SCALE button. 6. Now the tuner should show something near the C2, so you have to adjust the TOLERANCE pot again. 7. Keep doing this with all the "Cs" till the LED starts to shine blue. 8. When the LED shines blue put the patch cable from the CV OUT to the CV IN and push the SCALE button (module will self-calibrate). Probably no time to do this today but I will report back. Once i've done it I'm sure everything will be hunky dory. So just wondering who is using this module... love it or hate it? Any issues or quirks? Any user experience appreciated. I’m searching for a small (2-4hp) quantizer to pair with my Make Noise system and 2 pressure points/brains. It seems like it would work best for my setup given the videos I watched. @stephentrask - did you ever try calibrating and if so how did that work out? Still enjoying the Quant and finding it useful? are there any updates planned that'd enable 13tet and stuff like that or tritave scales? the list of standard scales is impressive btw!